In this example case, the functionalities of VANET simulation are introduced. It provides a guideline of how to construct a VANET simulation environment. The demonstration items are listed below. It shows how to construct a road (with multiple lanes), a crossroad (with traffic light), and a N-line-to-M-line merger. A landmark is set on a specific spot to attract a set of vehicles to move toward that spot. It shows how to deploy vehicles equipped with a single wireless interface card or equipped with multiple wireless interface cards. It shows how to deploy a RSU with the support of IEEE 802.11p/1609 protocols and services. 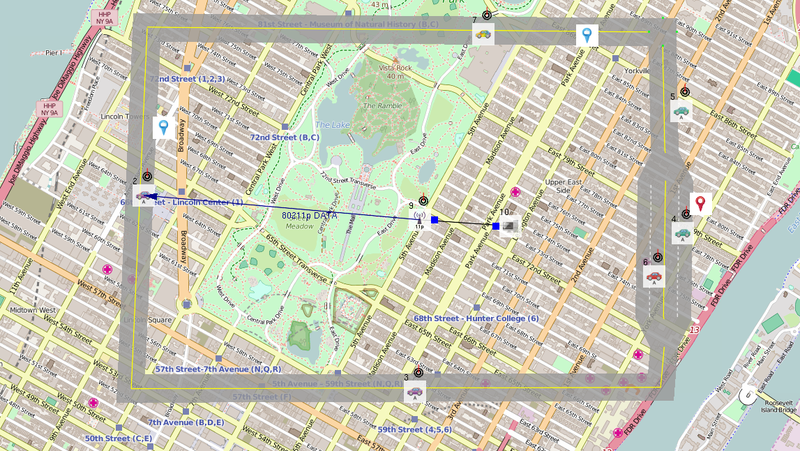 A background map/figure can be imported and its proportional scale can be adjusted to synchronize with the coordinate. Does a car make a lane changing automatically when moving on a road? Are each car’s maximum speed, acceleration, and deceleration adjustable? You will get the answers in this example case. In this case, we purposely arrange the roads with two lanes to provide space for overtaking. Car #3 is deployed behind car #2 while car #4 is deployed in front of car #2. The maximum speed of car #3 is set to 40 m/s (144 km/h) while the maximum speed of car #2 and car #4 is the default value of 18 m/s (64.8 km/h). Thus, when car #3 is approaching car #2, it makes a lane changing for overtaking. Then, car #3 overtakes again when it is approaching car #4. A landmark can be used to attract cars to move toward some specific spot. 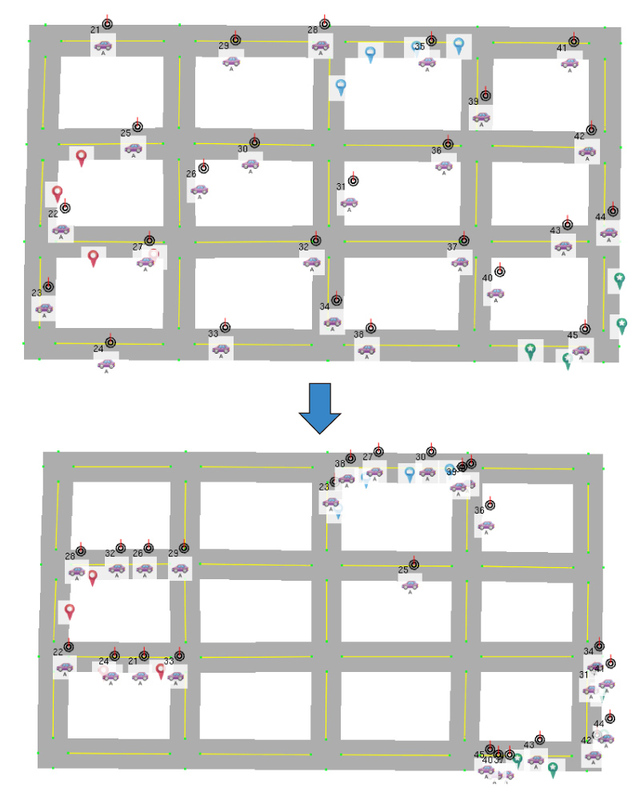 In the simulation environment with more cars, we can set landmarks to let a bunch of cars gather toward and stay within a specific area. In this example case, we use three different types of landmark, which are distinguished by different colors, to arrange three car gathering areas. 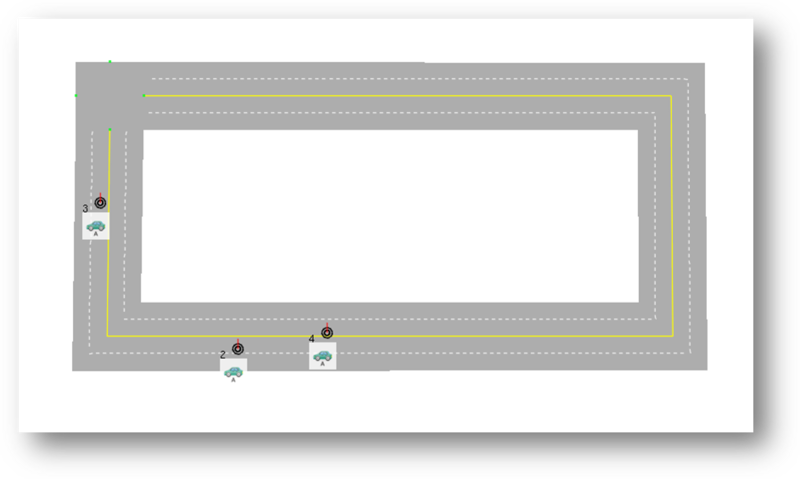 At the beginning, we randomly deploy cars on the road and assign each car a target landmark type. During simulation, a car first selects one target landmark and moves toward it. When the car reaches the target landmark, it selects another target landmark to moves to. This action is repeated again and again. Eventually, three groups of car are formed within the three arranged car gathering areas.